What is CD Ripping ? CD ripping is the process of copying or extracting data from a CD to a computer. Commonly used to rip audio files from CD and convert them to WMA, WAV, MP3 & many more, storing them as digital data on your PC's hard disk. CD/DVD ripping can be used to rip video files such as from DVD, a DVD has both video and audio on it with a special format suitable for playback. But it can also be placed into a computer and copied onto a hard drive. This requires using special software and the process is called "ripping". Despite what the name implies, the DVD is not damaged in any way. 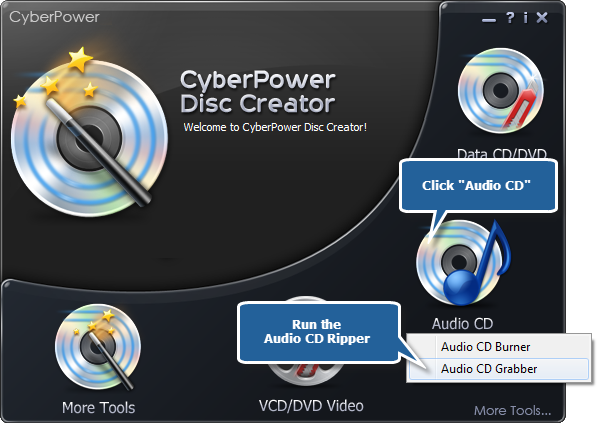 Launch CyberPower Disc Creator. 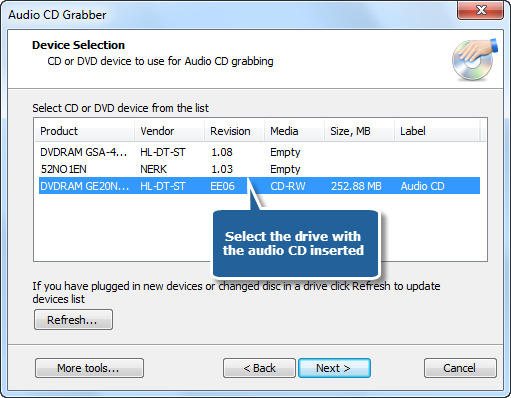 Then, insert an audio CD to the CD drive, click the "Audio CD" and choose "Audio CD Grabber" to run the ripper wizard. The ripper scans your system for the available devices. Choose one of the usable burning drives from the list (the system will select it by default if there is only one). If you plugged in new devices or changed disc in the drive, you can update the devices list by clicking "Refresh" button. 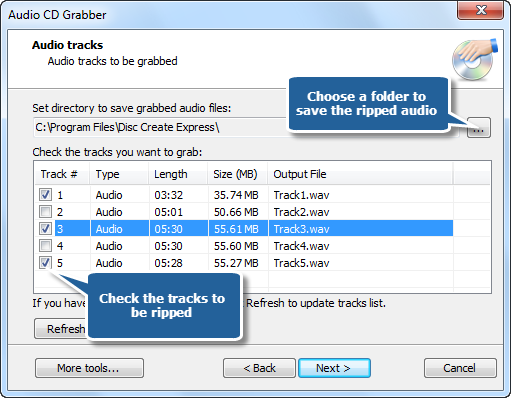 Choose an output folder used for saving ripped audio files. Check the listed audio tracks to that you want to rip. You can click "Refresh" to update tracks list if you have changed disc in the drive.